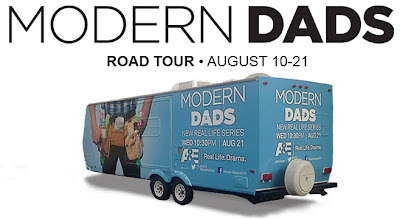 A&E is kicking off its new series, Modern Dads, with an interactive East Coast road tour this August leading up to the series premiere on August 21st. 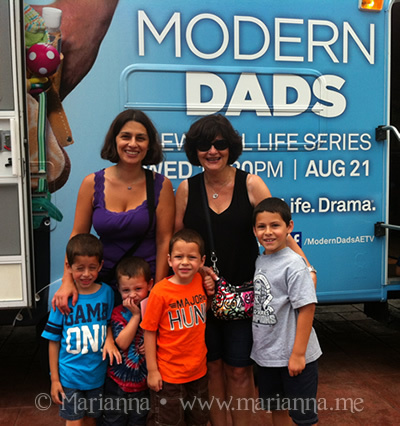 Parents and their kids are invited to check out the Modern Dads RV for a fun-filled family event. You'll be able to have your family photo taken for free, check out the ultimate Modern Dads "man cave," and walk away with Modern Dads swag including sidewalk chalk, bubbles for the kids, and more. 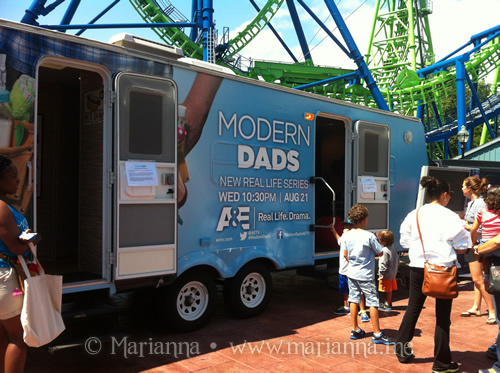 Check out the remaining tour dates here: www.aetv.com/modern-dads/mobile-tour. On Wednesday, August 14 the Modern Dads Road Tour rolled into Agawam, Massachusetts to hang out at Six Flags New England. Since this isn't too far from me, about 90 minutes, I loaded up my 4 boys into the minivan, dragged my mom along for the ride and we made our way there. When we arrived we headed straight for the Modern Dads RV. After we met some of their road crew and checked out the outside of the RV, we were invited inside to poke around and take a free family photo. There are plenty of props and toys for the kids to use in the picture. Mine chose guitars and a baseball hat. And yes, Dad was in fact at work, which is why Grammy got suckered into joining us.Not only do they email the photo to you pretty much instantly, but they will also print out a couple of copies while you are waiting in the RV. Of course once we parted ways with the cool RV, we tore up the amusement park. This was the first time my kids have ever been here and the first time for me since before my oldest was even born. So yeah, it had been a while. We had a blast. There are 2 separate areas dedicated to child rides and that is where we spent most of our time. My eight year old is just on the cusp of being tall enough for real roller coasters so I have a feeling a trip with dad here next year will be happening. 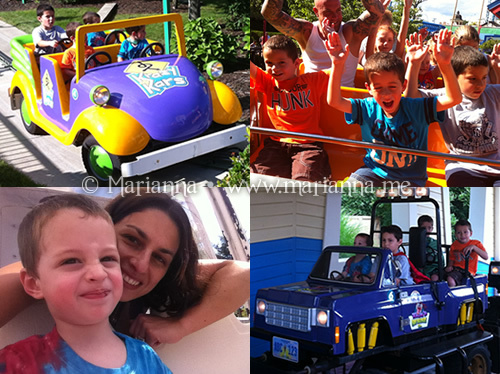 We ended up having beautiful weather and just a perfect family day at Six Flags New England. Modern Dads features four stay-at-home dads who while little unconventional, get the job done. Banding together, their "guys club" is a tribe of suburban, child-rearing dudes who are just trying to do their thing… with a kid (or four) on their hip. The new series will follow their exploits as they navigate their lives; juggling the requirements and social expectations of being both a "modern man" and "modern dad" while their significant others are off at work. 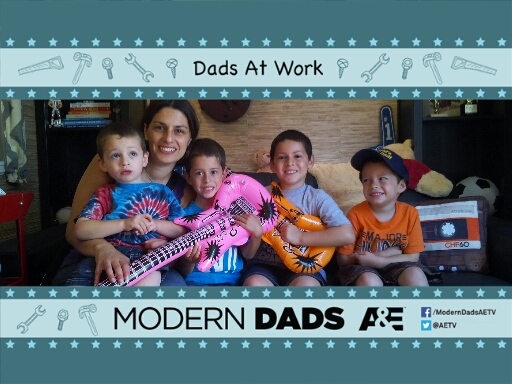 Modern Dads premiers on A&E on August 21, 2013 at 10:30/9:30c. Be sure to tune in! Thank you to A&E and Modern Dads for providing complimentary passes to Six Flags New England for my family so we could enjoy the Modern Dads Tour and the park. sounds like a cool show and a super fun day!! !